Welcome back to my blog, Rotten Ink, a place I love to talk about comic books, horror hosts, video games, toys, TV shows, cartoons and movies. As long time readers know, I have grown up watching and enjoying horror films and over the years made my own like “The Sadness”, “Werewolf of Ohio”, “It’s In The Crawlspace” and “Bark At The Moon: Scars” and produced many ohers like “Phantom Of The Grindhouse”, “Babysitter Massacre”, “Amityville No Escape”, “Church Of The Eyes” and “Alone In The Ghost House” to name a few. Let’s forget the ones I have acted in like “Woodsman: Forest Of Pain”, “Quite Nights Of Blood And Pain”, “The Wolf Hunter 2” , “Razor” and “Atrocity Circle” among many others. So as you can see, I really do love independent horror films, and I always jump at the chance to get copies of ones that pique my interest and better yet, ones that add a little something extra for fans like comic books based on their characters. 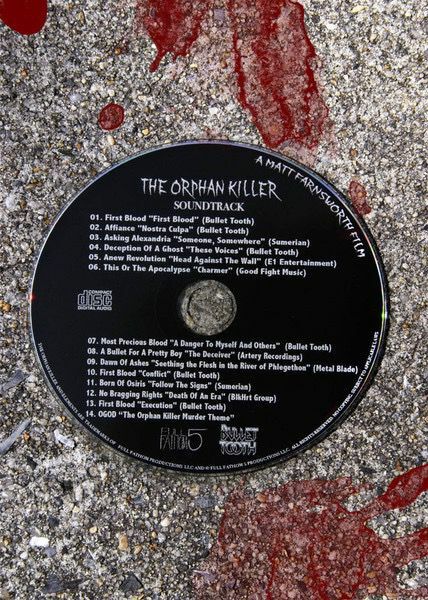 One that did just that, and has been on my radar for a very long time, is called “The Orphan Killer,” a slasher film that was released in 2011 and was a film I heard lots about from friends who said such things as the gore was fantastic, the soundtrack was heavy and the lead actress was smoking hot. All these things made me want to see the film even more! I ordered the comic based on the film from Indy Planet many years ago and waited to try and get the film from a convention or from Amazon, but they never seemed to have it. So finally in 2016, I tracked down a DVD copy of the film thanks to the film’s official website and knew that in 2017 an update based on this film and its comic was a must! So this update is for all you independent horror fans who like me love the films gory and enjoy the comics that follow. So make sure your doors aren’t barb-wired shut as we dive into the psycho world of The Orphan Killer! I should also note this is another of our “From Horror Film To Horror Comic” update and is a great way to kick off our countdown to Halloween! It’s time to briefly learn about the film/comic’s killer. Marcus and his sister Audrey witness the killing of their parents at a young age. Now an orphan at the nearby church, Marcus becomes too protective of his sister and does bad things to other kids who get to close. For his mean nature the nuns beat, torture and force the youngster to wear a mask to keep the other kids from wanting to talk to him and getting too close. Marcus is dubbed a monster, and the name The Orphan Killer is placed on him by the other kids, who claim he drinks the blood of kids and other horrific things. When his sister is adopted and he is left behind, his mind twists even more and Marcus becomes the living embodiment of punishment. Growing up, he becomes the killing monster they all thought him to be, and he starts at the church that kept him prisoner for all these years. 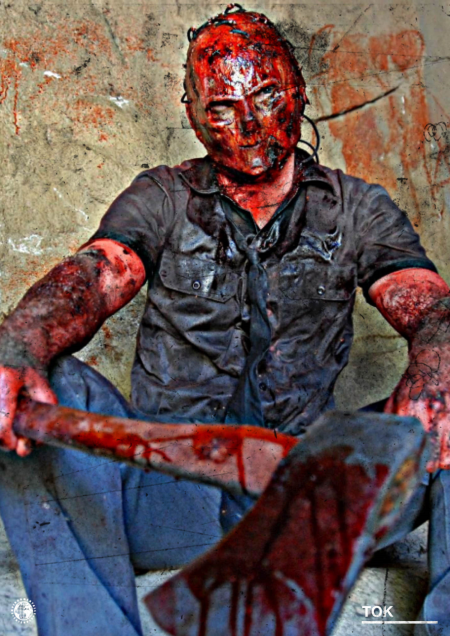 Wearing his mask and armed with barbwire, knives and an ax he goes on a killing spree that leaves blood flowing like wine and body parts flying. 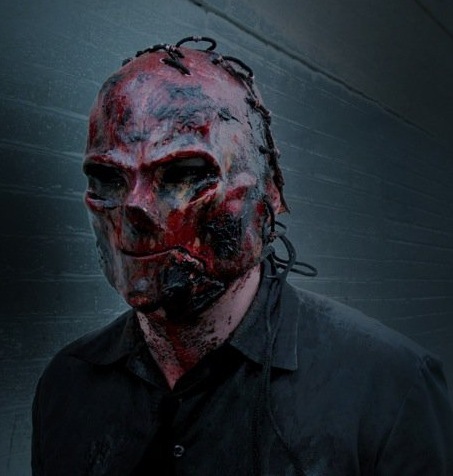 The Orphan Killer wears a mask that looks like a leather skull. He loves to whistle after a kill or during torturing and has no emotion when killing his victims. He talks about being chosen by God and blessed as if he thinks that his mission from heaven is to kill anyone he feels has done him wrong. 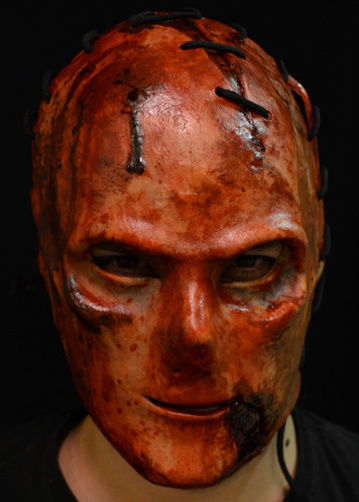 Strong, brutal and crazy is the best way to sum up Marcus Miller aka The Orphan Killer. The above is the plot that IMDB has for this blood soaked film that is sure to please fans of films like “Murder Set Pieces” and “Pieces” as it captures the raw nasty feel of those splatter films. 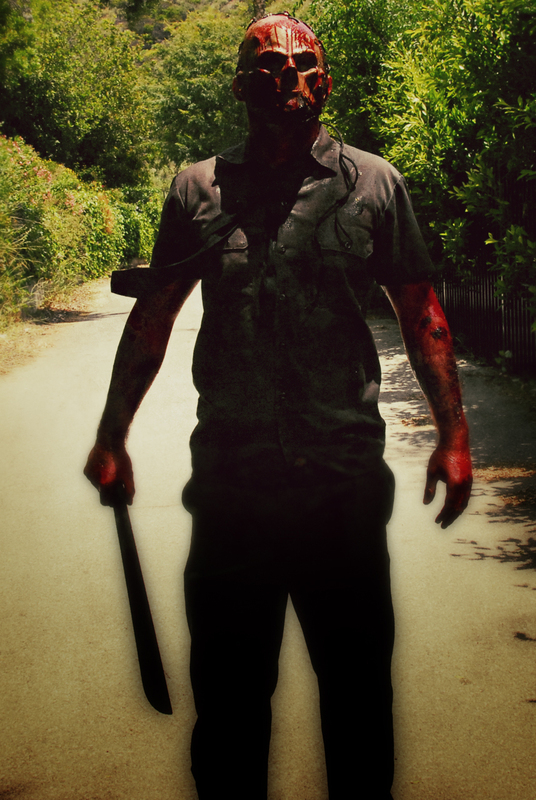 The film was released in 2011 and directed by Matt Farnsworth who also wrote the script and starred in as Officer Mike Hunt and created the killer Marcus aka The Orphan Killer. Farnsworth directed the 2005 film “Iowa” as well as the short films “Poor Man’s Dope” and “Dying For Meth” as well as acted in films like “Gacy”, “The Last Place On Earth” and “The Stepdaughter”. The film stars the actors like Diane Foster who plays the lead actress Audrey, David Backhaus plays The Orphan Killer and Ed Winrow plays Father Chuck and that’s one thing the film really has going for it is the acting is great for a Independent Slasher film with Diane Foster stealing the show. The films score and metal music is licensed from Bullet Tooth and is a heavy and moody score that helps add to the downbeat nature of the film. The film won a Festival De Cine De Terror De Molins De Rei award for Best Picture in Italy with Director Farnsworth being honored with an Antonio Margheriti award at the Tohorror Film Festival for his work on the film. When released the film was meet with very mixed reviews with many gorehounds enjoying the brutal nature of the film and its twisted plot while many other critics and Horror Fans had good and bad to say about it with many claiming it was just a cheesy cash in on a genre long gone from the mainstream. One of the films biggest none supporters was Fangoria Magazine who said this about the film “these filmmakers had everything they needed to create something special, and simply chose to go the least interesting route”. IMDB reviewers were also not overly nice to the film that holds a 3.9 rating out of 10 stars. As for my opinion I really enjoyed it and found it well worth the wait of seeing it as it lived up to the hype my friends told me about. I found The Orphan Killer to be as brutal and sadistic of a killer like Jason Voorhees and Michael Myers before him and Audrey was a likeable character I found myself routing for to make it out of the slaughter alive. While I liked the score music some of the heavy metal music sometimes was very distracting in scenes but still didn’t fully take me out of the movie. I did like that The Orphan Killer had his own nursery rhyme and chuckled at the metal remake of the song “Cry Little Sister” from the Lost Boys movie that acts as the song between this brother and sister. If you’re a slasher film fan and enjoy lots of gore, metal music and a truly smoking hot lead actress then check out The Orphan Killer for sure. In the world of Independent Horror Films I have many favorite actresses who embody the skills needed to draw the viewer into the characters they are playing and it takes more than just being pretty for me to put you on the top of my lists of actresses I would say are must watch if their names are attached to a Horror Film. Names like Danielle Harris, Denice Duff, Tina Krause, Asia Argento, Brinke Stevens, Charlie Spradling, Erin R. Ryan, Haley Madison, Maria Ford and Sara Bay are a few names on this list of actresses who are the total package who are not only beautiful but can truly act and have the ability to draw me as a viewer into the film they are in. After watching The Orphan Killer I am proud to say that actress Diane Foster has been added to that list as she is stunning and really good in her role as Audrey as she made me feel that she really had been tortured by a madman who wanted her dead from her screams and tears. What I really enjoyed about her performance is that she is not just some cute bimbo character in fact she is the opposite and is smart and sweet and when pushed just don’t role over and die…oh no she fights back and Diane truly makes the character seem real and legit. I would love to see her in more Horror film roles and think she would be a perfect cast for the next Halloween, Friday The 13th and Tombs Of The Blind Dead films and its shocking that she has not been in anymore films with her last role being this 2011 film! But while she might not be currently acting she also has roles in the 2005 film “Iowa” and the 2003 film “Descendant” that is as well a Horror Film. With lots of talks of a sequel to The Orphan Killer here is hoping that Diane will return to her role as Audrey as she is really fantastic in her acting ability and very easy on the eyes. The Orphan Killer is a film that clearly the films creators really believe in as the quality of the script, acting and gore are all top notch. 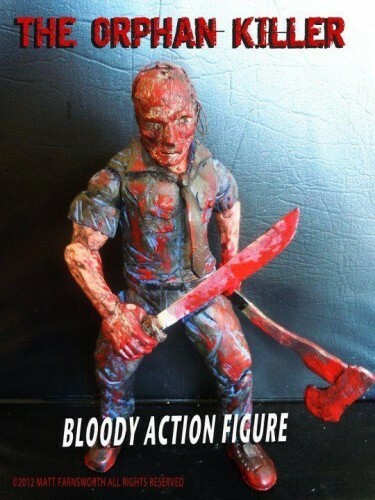 So with this pride they had also comes merchandise products like a comic book, a limited action figure, poster, film soundtrack and even a Halloween Masked based on the title killers look! While I do own the Comic Book and the Soundtrack that came with my DVD it would be cool to own a poster of this film signed by the director Matt Farnsworth and actors Diane Foster & David Backhaus. But if you enjoy this film you can find many great items to collect and I recommend checking out the comic if you’re a Horror Comic reader. Also on December 13, 2016 thanks to Reel Gore Releasing a Blu-Ray/DVD Combo pack the film is now way easier to find. So now that you know just how sick and demented The Orphan Killer is I think its time we took a look at his nasty deeds from blood to ink as we look at the 2012 comic based on the movie. As I am sure his kills will be just as brutal from the movie screen to the comic pages and I really want to see if this is just an adaptation or a new killing spree for our killer. I want to thank Indy Planet for having this in stock and I want to remind all you gorehounds and maniacs that I grade these on a star scale of 1 to 4 and am looking for how well the comic stays to the source material, it’s entertainment value and it’s art and story. So beware of the splatter and make sure to avoid his machete as we take a look at the sinister murdering deeds of The Orphan Killer. Audrey is a woman who is beaten and bloody and crawling away from a masked killer who is holding an ax and they share some words as it’s clear they are brother and sister and they don’t like each other, just as the killer is swinging down a blood splatter hits. We flashback and we are in New York as Audrey is going to her job at a Catholic School and has been dropped off by her boyfriend Mike who is a cop. The young ladies who are in the show are talking about an urban legend that has been around the school for years about Marcus Miller aka The Orphan Killer who has shown up to the church and has locked the doors after the show and the young ladies have went home. Audrey as well as the Father and workers are left inside and one by one The Orphan Killer butchers the workers and nuns in blood splattering ways. The Orphan Killer tracks down Audrey in the hallway and knocks her out and when she wakes up he has her bound by barbwire and cuts the Father’s arm off before her eyes all the while talking about God and Jesus telling him what he is doing is the right thing, you see Audrey is his sister and even at a young age he had a twisted mind and was tortured by the nuns as he was stricken with evil in their eyes and now he wants revenge on his sister for not being their for him. Mike shows up to the church to find his girlfriend and is attacked brutally by The Orphan Killer and while this is happening Audrey breaks free from her razor sharp binds and mercy kills the Father who is bleeding to death and has a showdown with her brother The Orphan Killer on top of the building that leaves the wounded Mike shooting The Orphan Killer who falls off the roof and he and Audrey have survived the massacre. This Horror Comic is an adaptation of the 2011 film and does an ok job of translating the film into a comic, and I say ok because if you had not seen the movie many of the films key plots are speed up and looses the impact of not only the kills but also the twists of the films brother and sister plot. The plot that is used is very simple for the most part and follows Audrey a woman who is a teacher at a Church and who also has a psychotic brother who has targeted his old school and his sister for revenge on how he was treated when he was younger and an orphan, his hatred for his sister was because she was adopted and he never was plus he was forced to wear a mask and treated poorly by the nuns who thought he was evil and when becoming older and still wearing the mask he thinks God wants him to bring sinners to justice. Audrey in the comic is just kind of a bland character and her personality is not really able to shine besides the fact we see that she has the will to live and that she truly hates her brother and what he has become. It’s a shame as Audrey in the movie was a complex and great character and in the comic she is just merely around. Her cop boyfriend Mike is only at the start and end of the comic and is only around to in the end shoot the killer and to save his ladylove. The Church workers, nuns and The Father are just filler and add zero personality to the issue and are just around to be killed in horrific ways. 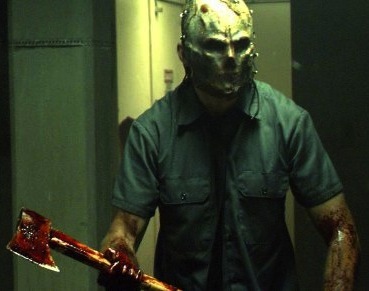 The Orphan Killer himself is a scripture speaking, sharp weapon swinging brute of a man who just kills cause he is crazy and has been sense he was a kid, but the Nuns instead of getting him help just mentally and physical abused him and helped creature the psycho killer personality he has. But just like Audrey he is cool in the comic but way better in the film. The comic has some splatter moments but oddly enough the comic is way more tame than the movie and for the most part the violent acts seem like a second thought and pass panels way to fast loosing the impact the murders should have, but keep in mind it does have the read stuff flowing. The artwork from what I can gather is done by the films director and the creator of The Orphan Killer universe Matt Farnsworth and has a style that blends underground and American manga and for the most part while not a style I am a super fan of it looks good. The cover is very eye catching and screams independent horror comic and that’s a great thing for someone like me who loves that style of comics. While this comic adaptation of the film is good I would say that for fans of the flick this is a great comic for your collection, for those who have not seen the film I think it might be one that will not find a home in your comic box. But in closing I love the fact this comic is out in the world and wish more independent horror films would follow this idea. Check out some artwork from this comic and see they style you will see in the issue. The Orphan Killer is a great splatter film and an okay comic book and was the perfect way to kick off our countdown to Halloween! Again, I want to stress this comic was entertaining and well done for fans of the film, it’s just that people unfamiliar with the movie might not be as impressed. But our next update takes us out of the church and into the woods of Burkittsville, Maryland as we take a look into The Blair Witch Project and the comics made by Image and Oni based around the cult classic flick. So until next time, watch a Horror Movie or two, read a Comic or three and as always support your local Horror Host! See you next time….wait, what was that noise.. sounded like….Ahhhhhh! !